The First Mile Project recently began developing its second community garden in the Belum-Temenngor Forest Reserve, this time, in the indigenous village of Chuweh. The BRAINetwork team previously conducted the Community Sustainability Assessment in Chuweh, which highlighted the need to improve the village’s food production. Chuweh have experienced problems growing food crops in the past due to porcupines interfering with their attempts at growing. Previously in Air Banun, we developed a community garden with a fence designed to deter wild boar. This involved creating a horizontal fence with mesh placed vertically at its base, essentially creating an “L” shaped fence. So far the crops are yet to be attacked by wild boar and so for now it seems that the horizontal deterrent is preventing the wild boar from burrowing under the vertical fence. We applied the same strategy when developing the fence for Chuweh. When we arrived in Chuweh, the villagers had prepared the land for the garden and were busy gathering wood from the rainforest for the fence. Together with the help and support of the villagers, we constructed the “L” shaped fence, with a 60 metre perimeter, in a matter of hours. 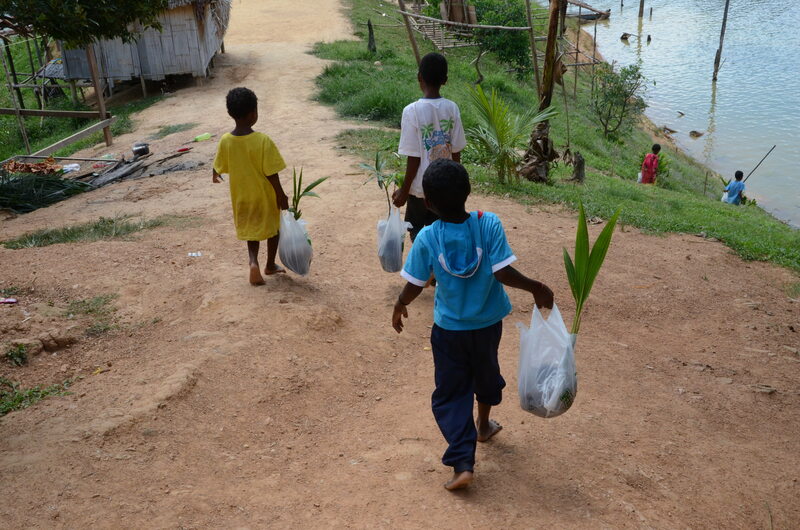 Here you can see some Orang Asal children carrying some of the fruit trees that we brought for their new community garden. We planted five banana trees, five jackfruit trees, three apple-mango trees and three coconut trees as a starting point for Chuweh’s community garden. We also provided the village with 12 different types of vegetable seeds and growing pots so that they will have additional from crops to grow in their community garden. 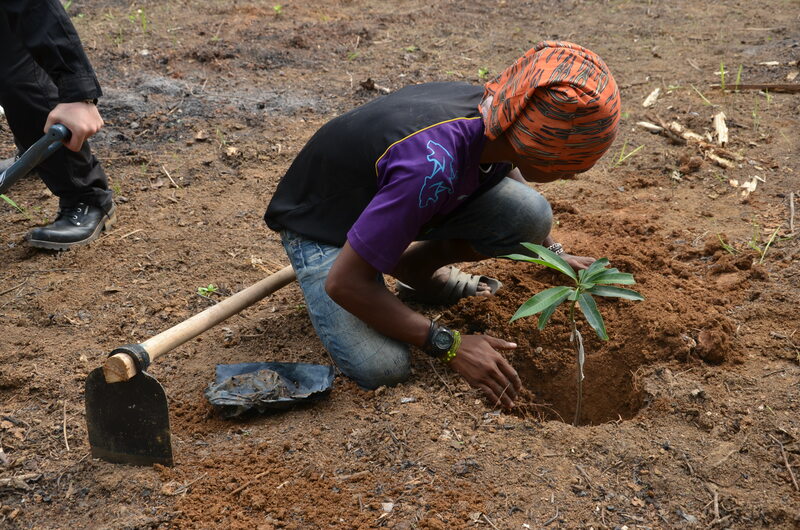 Here’s a member of Chuweh’s community planting an apple-mango tree village. Naoki and Kazuki, two Toyohashi University of Technology students who were conducting Community Sustainability Assessments in two indigenous villages along Lake Banding as part of a Summer School collaboration program between USM and TUT (more about that in a future blog), finished their day of data collection at Chuweh. When Naoki and Kazuki realized that I could use some assistance in completing the garden, they jumped at the chance to help and weren’t afraid to get their hands dirty. 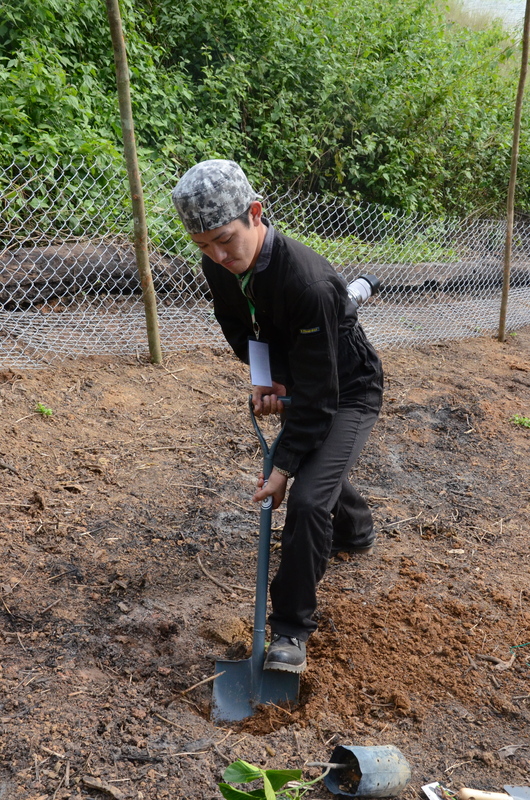 Here’s Naoki preparing to plant a jackfruit tree. We’ll see how the garden develops over next few months as the First Mile Project steps up it efforts and introduces more of its programs to Kg Chuweh and its neighboring villages.